Canadian Spray Foam Systems Ltd. in Saskatoon works with commercial clients in many industries to provide customized insulation solutions for every building size, type, and location. From manufacturing plants to retail stores, our experts will select materials, study floor plans, and survey the building to pinpoint specific insulation needs and concerns. We work with new construction and insulation upgrades and have solutions to fit within your budget. We have insulation materials to cover roofs and roof decks quickly, ensuring safety and high performance to withstand heat, cold, and the elements. For metal buildings, we have specific insulation products to prevent rust, keep out excess moisture, and boost thermal and acoustic performance. When it comes to interior walls, the insulation products we use for commercial buildings gives you complete control over heat and sound pollution, ensuring your employees and guests feel comfortable in a quiet environment. Air handling systems are designed to transfer heated and cooled air for the square footage of the building. Proper installation near these systems ensures that energy costs stay as low as possible and the air is distributed efficiently. If you have areas that need to remain at a high or low temperature, insulation can be adjusted to ensure these temperatures are reached quickly and maintained. Our commercial floor and ceiling installation can be made to work with solar and traditional heating systems. Additional insulation for exterior walls for buildings with lobbies, stairwells, and other low traffic areas is also taken into consideration. 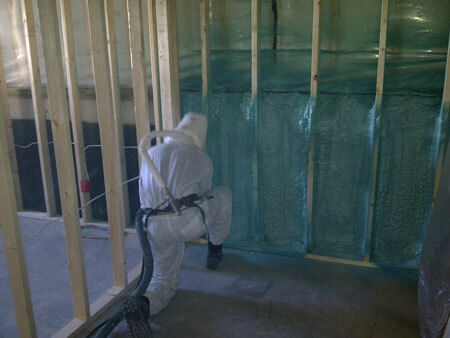 Canadian Spray Foam Systems Ltd. can also create insulation for commercial foundations of any area size, adapting the installation techniques for the temperature and moisture requirements of the ground floor and basement. From upgrading the insulation in a small area to new installation for your entire commercial property, our experienced insulation professionals can accommodate your needs and save you money on your utility bills.